Hi. My name is James. I was born in Ipswich, Queensland on the 2nd of July 1988. At this time the doctors found I had a serious heart condition but none of the doctors could find the reason why. I was taken to the Prince Charles Hospital at Chermside where they operated on me when I was just 4 days old. I had a shunt put into my left shoulder which unfortunately failed, so they tried this again when I was twelve days old. I was transferred to the Mater Children’s Hospital for tests to find out what was so wrong with me. At this point I had no swallow reflex so I had many tubes coming out of lots of places. Then another ambulance ride back to Ipswich Hospital where my parents asked the doctors about a peg feed set up. The doctors said it was a risky procedure and I did not have a high survival rating at that point. So, they decided not to go ahead with it. Some days later while my dad was at work one night he heard on the radio how a child in Sydney fell off his motorbike and received medical attention from the Camperdown Children’s Hospital. So my dad got into contact with them as quickly as possible, at which point he told them he was from Glenn Innes NSW. The Camperdown Hospital offered their expertise and my father drove me all the way to Sydney where they found out why I could not swallow. So they told my parents to bring me back in two weeks and they would operate on me. After my opp they told my parents that I would be able to eat by the time I was 3 years old., and I was. Then one year later, my baby sister was born. I was 4 by this time. A few years later we moved to Newcastle which is 2 hours from Sydney and we were there for three years. 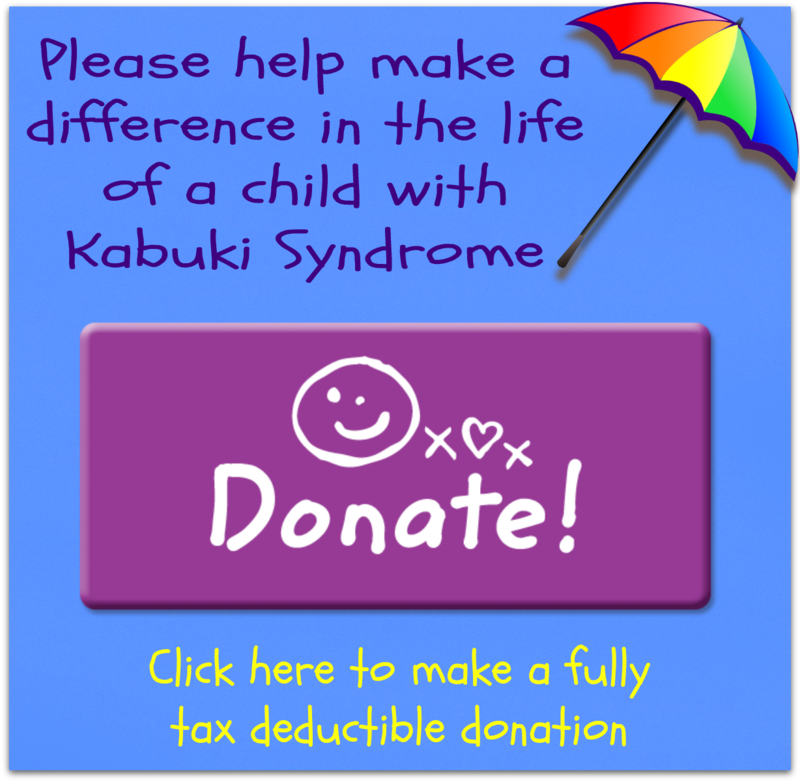 In 1996 I went to the John Hunter Hospital where they told my mum I had Kabuki Syndrome. It was a very rare condition at the time and there were only 89 officially diagnosed cases of Kabuki in the world. This was the beginning of my Kabuki Journey and finally Mum and Dad had some answers about what had been going on with me since I was a baby. In December 1997 our family moved to Kingscliff NSW and after another move a year later, Mum, myself and my two sisters moved to Hervey Bay where I started school at the local special school. I had a few years trouble free until I had a heart operation in June 2002, I had to have my sternum wired back up. About a year later the wires broke and I had to go back into surgery and have it done all over again! In December 2005 I dislocated my left knee-cap outside Suncorp Metway Bank in Beaudesert. I was taken to the Beaudesert Hospital where they x-rayed my knee and then said I would be a bit sore for a few days. But, two days later my knee dislocated again! I went to see my doctor and she wrote me a referral for an appointment for the orthopaedic surgeon at the Logan Hospital. While I was waiting for my appointment, GUESS WHAT HAPPENED?! So I went to the Logan Hospital to the emergency department and after a few visits to a couple of doctors it was decided I needed a knee operation. After my knee operation it was decided that I should take the rest of the school year off. After I decided not to go back to school I had to find something to do so I started at St Mary’s. St Mary’s is a care provider for aged and disabled people; I had a carer and spent a few hours out and about doing all sorts of activities. Also I started at Beaucare Aged and Disability Services where I would go tenpin bowling on a Monday with a group and on a Thursday we set out on lots of fun trips. Eventually I also started a Wednesday group where we just socialised. During this time I got a family support package I also got a post school package and this led me on my journey to TAFE.Now I am 19 years old. I live with my dad Peter in a small country town of Beaudesert, just south of Brisbane QLD. I have been attending Metropolitan South Institute of TAFE for 12 months doing numeracy, literacy and also a computers course. I like going to TAFE because I like the students and the teachers and also the chips and gravy that I buy from the canteen! I would like to thank a few people who have helped me over the years, Prof Dorothy Radford, my Dad and all my good friends who have supported me.